This is a story about an unexpected financial event. 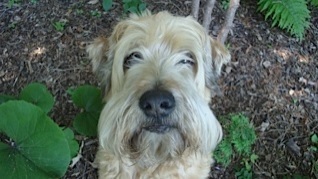 It all starts with my good dog, Ernie, a soft-coated wheaten terrier. For years, Ernie lived up to his breed’s reputation as a fierce chaser of vermin, keeping my pride-and-joy garden safe from marauding bands of rabbits. Then came the sticker shock and the neuroeconomics lesson that is the point of this article. The replacement cost of those mature trees and shrubs was several thousand dollars – which was precisely several thousand dollars more than I had planned on spending on replacement trees. And in my upset over the horticultural ruin, I got caught up in a kind of thinking characterized by Narrow Focus: namely, focusing exclusively on just one choice while being blind to all others. Fortunately, I caught myself. The tipoff for me came when I heard myself tell a friend I was stewing over “whether or not to replace the trees”. According to authors Chip and Dan Heath in their book, Decisive, that phrase — “whether or not” — is a surefire indicator that a person has entered Narrow Focus. And that frequently leads to regrettable decisions, particularly in the world of finances. The way out of Narrow Focus is simply to go through a forced exercise of deliberately considering other options. What other choices exist in this situation? And what is the Opportunity Cost of sticking to the first option – i.e. what would I have to give up? I could pay more thoughtful attention to my husband’s yearning for a boat. And sometime during that process of deliberately listing other options, I came to the realization that replacing the trees was just plain DUMB. Unless I was also planning on replacing Ernie, buying more trees was equivalent to buying more rabbit food. Now THAT was something I hadn’t even considered while I was stuck in Narrow Focus. So the next time you’re facing one of those financial decisions that involve a heightened level of emotions, remember that you, too, are at risk of being in Narrow Focus. Listen for “whether or not” statements in your deliberations. Consider the Opportunity Cost. If you’re stuck, ask your friends and family to help you see other options. Chances are you’ll make a much better decision. It’s official: the NHL is in lockout. Come October, the athletes will stop receiving pay cheques, and we’ll be hearing the news stories about players who are in dire financial straits because they spent the summer spending money they hadn’t yet earned. And many people will roll their eyes and mutter about ‘poor little rich boys’, and thereby miss out on an important life lesson – a lesson that probably affects you and yours, me and mine. A newly minted physician makes up for all the years of financial deprivation she underwent in medical school by buying an awesome new car and great condo as soon as she lands her first job. Now she’s having a hard time making ends meet on a monthly basis. A man who knew he would be receiving a sizeable inheritance discovers that, by the time he’s received it, he’s already spent much of it on things that he thought would be making him feel much happier than he’s actually feeling right now. On top of having overestimated the Happiness Hit he thought he’d get from the purchases, he’s got major remorse about having squandered a legacy gift from his grandmother. Knowing a $1000 tax refund is due them, a couple allow themselves to spend more liberally than usual. When the credit card bill arrives, they’re shocked to realize that they’ve spent more than double their tax return. Promised money not yet received has a curious effect on our brains. It’s subject to a number of mental biases. One of the features of this mental accounting is that future funds are often mentally designated as ‘Special’ Money, something that really doesn’t have anything to do with regular family finances. As a result, the money is not managed with the same kind of prudence that we would normally apply to money that we have already earned ourselves. Another tendency is for us to think of future funds in vague but overly optimistic terms. (e.g. “MORE money is coming my way. Woohoo!) It’s mentally encoded only as ‘MORE’, which is so unbounded as to unbridle the spending monster. That’s why it’s so common for people to find that they’ve already spent more than their tax refund, or their Christmas bonus, or their first pay cheque long before the funds ever arrive. And finally, yet another quirk of this mental accounting is that it is far less painful to spend future earnings than it is to spend cash-in-the hand, here-and-now money. This leads to the phenomenon of credit card bills being truly, honestly, shockingly higher than we were expecting them to be. While a multi-million dollar sports contract may not be in your future, a tax refund, new job, or inheritance might be. As it turns out, some of the best financial advice given to professional athletes when they sign their contracts is sound advice for the rest of us. Want to know what that is? Do nothing with the funds until after they arrive, and then for a long time afterwards. Let them sit there until the emotions have calmed and the capacity for reasoned judgment is restored. This has the simultaneous benefit of allowing the funds to seep into consciousness as something that is truly yours to manage, not some fairy-godmother-bestowed Magic Money that doesn’t follow the normal rules of fiscal management. Continue to follow the same basic rules that form the basis for financial prudence and success in all walks of life. The primary use of the funds should be to stabilize your financial situation: to pay off consumer debt, to set aside money for predictable upcoming expenses, to establish an emergency fund. With the remaining funds, spend time researching and planning the experiences you’d like to create. It allows you to give to the people and causes that matter most to you. It also cuts down on Buyer’s Remorse. This serves as a really critical antidote to the excessive optimism that I sometimes see in my financial coaching clients. If things like a work disruption, illness, or unexpected legal issue should delay the release of the funds, would this wonderful buying or investment opportunity plunge you into financial crisis? If so, go back to the chamber of sober second thought and re-work your plan. Just a few things to think about while you’re not watching hockey for the next little while. Keep on with the challenge of making YOUR dealings with money work better for you and yours. Across North America this month, an important rite of passage is taking place: College and university students are leaving home, moving to new towns and cities, and setting up their first living quarters away from their parents. And the parents of these young adults are going through their own rite of passage: Resisting the urge to make everything absolutely perfect for them. Or, as the case may be, NOT resisting the urge. I have witnessed very wealthy parents set their children up in first apartments so tastefully appointed that they could be featured in design magazines. I have also watched parents of much more modest means overextend themselves financially in order to ensure that their kids’ experience of want is virtually eliminated. In both cases, the parents have robbed their children of important personal growth and development opportunities. The worst of it is that, when parents give so lavishly, it leaves the young people with little to strive for and even less to be proud of on their own. Here’s what I have come to know: Young people absolutely benefit from the experience of slightly skuzzy carpeting and secondhand pots and pans. They go through important maturation processes when they experience what it is to go without, and to make do, and to wait. And without those early adult experiences of knowing that they can defer gratification, that they can measure themselves by standards other than the loveliness of their possessions, something truly frightening happens: Those young people move back home after graduating, shrink from the next round of important life challenges, and require large machinery to dislodge them. 1. Pay close attention to any experience of resentment you might be having. This emotion acts as an exquisite early warning indicator that you might be giving TOO much of your time, energy and resources than is necessary or wise for one or both of you in the relationship. Resentment is often a cue that this emerging adult child of yours has entered a new stage of development, and that it is therefore time to shift how your support is offered. This usually involves transferring more of the responsibility to the child for management of financial and other resources. If you allow the shift to occur, your child will be better able to master the tasks of each new stage of independence. And, not coincidentally, some vital mental energy will be freed up for YOU to focus on more developmentally appropriate things in your own life—your health, your other important relationships, new life goals, etc. 2. When you do feel led to offer financial support, do not give them the curse of a blank check. Give them a modest amount of money that will force them to exercise prudence and to make their own contributions. Make it clear that there will be no additional funds forthcoming for living expenses. And stick to your guns, even when they mess up. 3. Finally, make a point of letting them know how proud you are of their growing independence, of the decisions they are making. Voice confidence in their ability to survive some of the tough experiences they’re having. When they’re making the kinds of decisions that make pride or confidence harder to come by, dig a little deeper for it. And when that doesn’t work, make like the cat: Go shred the toilet paper until you feel better. Chances are high they will make regrettable consumer purchases at some point. Doesn’t everybody? Didn’t we all? But mistakes made can lead to lessons learned. And hard financial lessons learned early in adult life tend to be much less costly than those learned later. Here’s wishing you and yours much wisdom as you navigate life’s transitions.